Once we saw Sarah Musgrave’s review in the Gazette about Honi Rose, we decided to give it a shot. It was a weekend afternoon and we didn’t have much to do. Obviously my reflex to counter boredom is to ask myself: “what can I eat today?”. Opting to try out something new, this restaurant seemed like it would be an interesting pick for the downtown area. With most of the other restaurants around being fast food joints or food courts, if this one turned out to be a keeper, it would be an easy choice to eat out at, as it is in close proximity to my apartment. With its loud flashing neon sign, the exterior doesn’t strike you as a place serving traditional Iranian or Persian cuisine – on the contrary. Walking in to the near empty restaurant, we were served promptly by a friendly young lady. We asked for a couple of recommendations and it turned out some of the best stuff was no longer available! They had already sold most of their stock or had it reserved for locals celebrating the Nowruz. That being said, she recommended the salad to start, stating that it was really authentic and specific to Iran. When we got it, it didn’t taste much different than your typical house salad in the Western style. A couple lettuce leaves, grape tomatoes and a creamy sauce – nothing that bore any flavor resemblance to anything typically Iranian, at least to me. That was really disappointing for us. The tzatziki followed in a deep bowl, accompanied by some triangular slices of pita. The tzatiki was watery and not very tasty at all. The yogurt-cucumber flavor didn’t quite come through and the quantity of it was just overwhelming. Even though we worked on it throughout the meal (we don’t like to leave food unfinished if we can help it), we got nowhere near the bottom. Next came a light salad with tomatoes, cucumbers, onions which was a little too sour for my taste but apart from that, not bad. 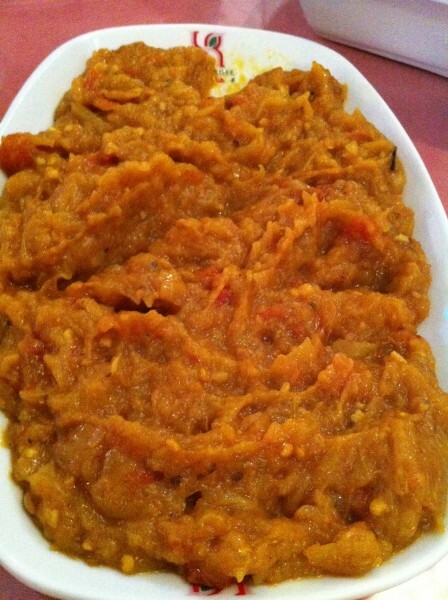 The smoky mirza eggplant dip was really nice – though I didn’t love the smoky flavor, I do admire the way they managed to integrate the smokiness into the dish. That was really something. With every bite, you got this deep, rich flavour that was really unlike anything I’ve ever had. For the mains, we had the fried fish, the lamb shank and the koobideh, which all came with generous portions of rice. The fish was standard. With a touch of lemon juice, it tasted just fine. 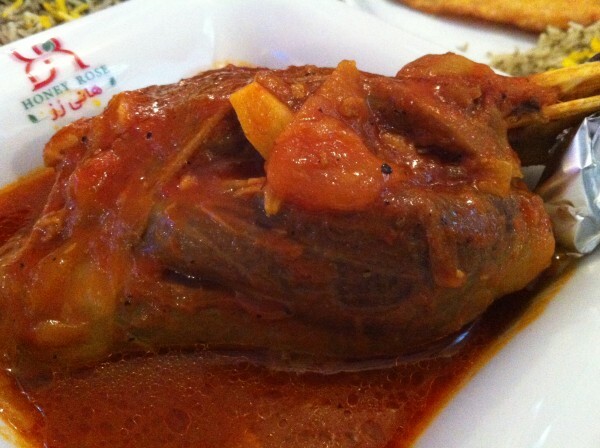 The lamb shank was tender and cooked well – pieces of meat fell easily from the bone. The tomato sauce in which it was bathed was a great pairing giving it just enough moisture and juiciness. 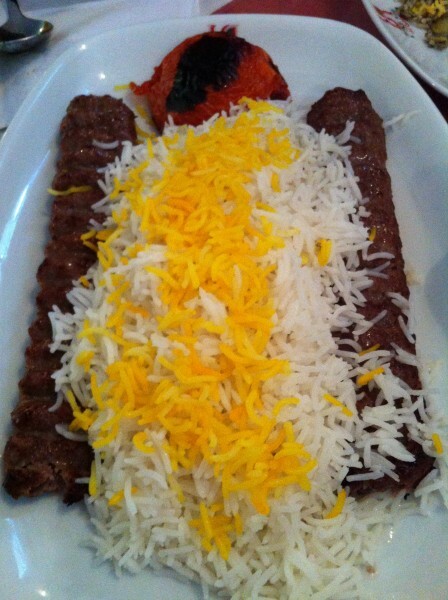 I wasn’t crazy about the koobideh as the meat wasn’t spiced quite as I had expected. The meat itself was a little tough and slightly above room temperature. Tags: Cucumber, Dinner, Drummond, Eggplant, forkandtell, Fried Fish, Iranian, Koobideh, Lamb Shank, Lemon, Lunch, Minced Meat, Mirza, Montreal, Nowruz, Persian, Rice, Salad, Smoky, Tzatziki, Yogurt.